The latest incarnation of Pere Ubu. To say that Pere Ubu’s music is “strange,” is unfair. To say that it is wonderfully strange is an understatement. Pere Ubu is probably one of the most influential and musically provocative independent bands of all time. They release one acclaimed album after another, and still remain commercially unviable by virtue of their unique sound and uncompromising approach to the music business. They have been slapped with labels like “industrial,” “underground” and “avant garde” (which my computer wants to auto-correct to “avant garden,” which somehow works too.) The band themselves call their music “avant garage.” They are often name-checked as inspirational pioneers by punk rockers, post-punk rockers, prog rockers and new wavers alike. I was first introduced to Pere Ubu in 1978 by my beloved high school English teacher and dear friend to this day, Ann Porath. When I say “introduced,” I don’t mean that Ann actually played their music for me. In fact, I doubt there are many Pere Ubu albums mixed in alongside Ann’s dusty copies of Joni Mitchell records. I think what happened is Ann knew I loved music and she asked if I had ever heard of them. The fact that Ann had a good friend who was dating the band’s keyboard player at the time, elevated both my curiosity in the band and Ann’s coolness factor in one fell swoop. I immediately sought out The Modern Dance, and on first listen I knew I was not in Kansas anymore, musically speaking. 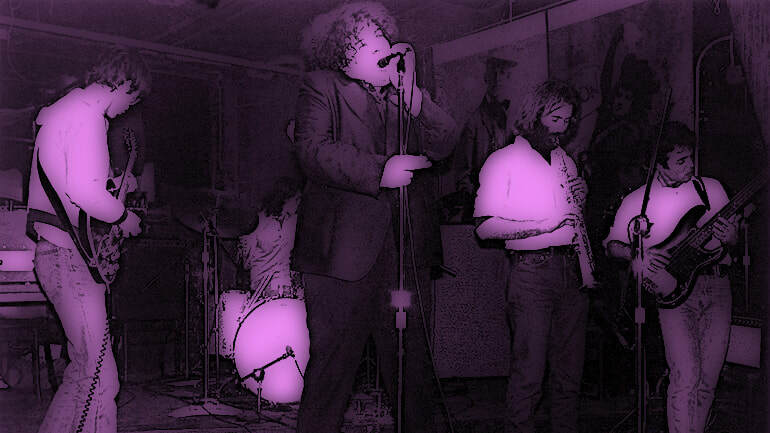 Pere Ubu, the early days. Steven Grant writes in The New Trouser Press Record Guide: “Pere Ubu combined disorienting—often dissonant—rock and urban blues in a stunningly original and outlandish mix, but never lost an urgent, joyous, party atmosphere. Pere Ubu are to Devo what Arnold Schoenberg was to Irving Berlin.” Ha! 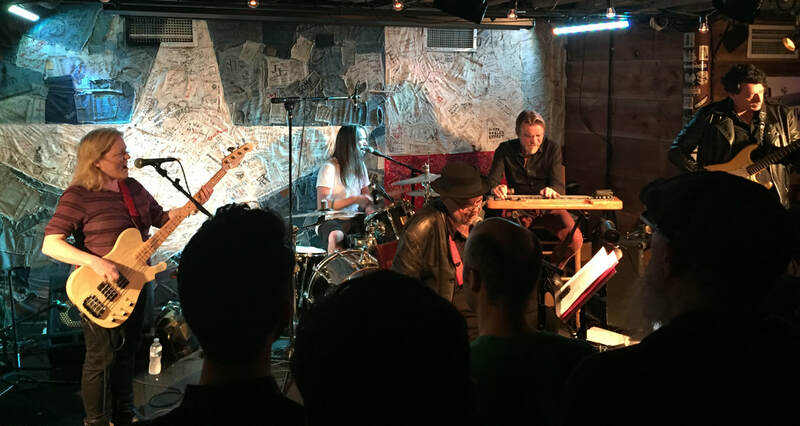 Well, yes all those elements were definitely in play the other night when the band showcased music from their new album, 20 Years in a Montana Missile Silo, but that barely scratches the surface of what took place in the basement of Hill Country BBQ. 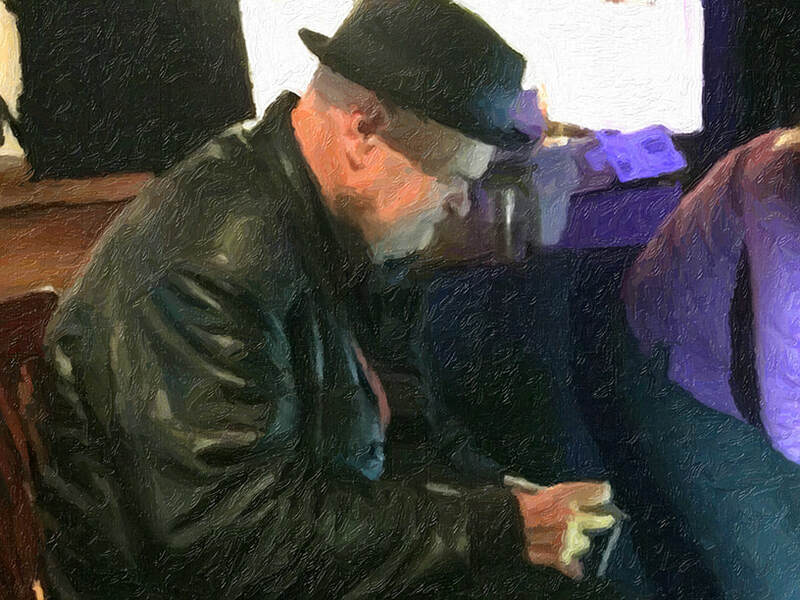 Pere Ubu on stage at Hill Country BBQ on November 9, 2016. The latest version of Pere Ubu is the embodiment of the adage “rode hard and put away wet.” There is nothing glamourous, youthful or “rockstar” about them. The lead singer performs seated in front of a music stand holding a sheaf of lyrics. He needs suspenders to hold his trousers up, a cane to shuffle on stage to his seat, and reading glasses to see the lyrics he’s gonna sing. The rest of the band look like it’s been a while since they had a hot shower and access to a washing machine. And yet… the music was incredible, despite the fact that on several occasions Thomas didn’t think so and made no bones about berating the band, yelling things like: “Play hard! Like you mean it!” and “Bunch of damn girl scouts.” Later he shouted to them mid-song: “Control! Control!” Each time he lashed out, the band seemed to absorb his verbal abuse and play with greater intensity. ​“I Hear They Smoke the Barbecue.” Light it up boys and girls!